Th-INK-ing of You: Another Sneak Peek! Today, I'm sharing another sneak peek with you. 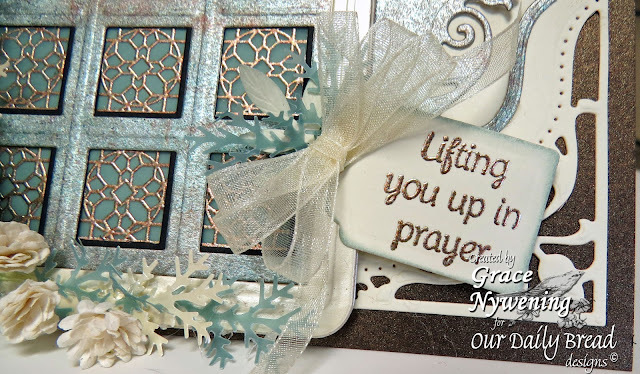 This is a wonderful new stamp and die set coming your way from Our Daily Bread designs on May 1! 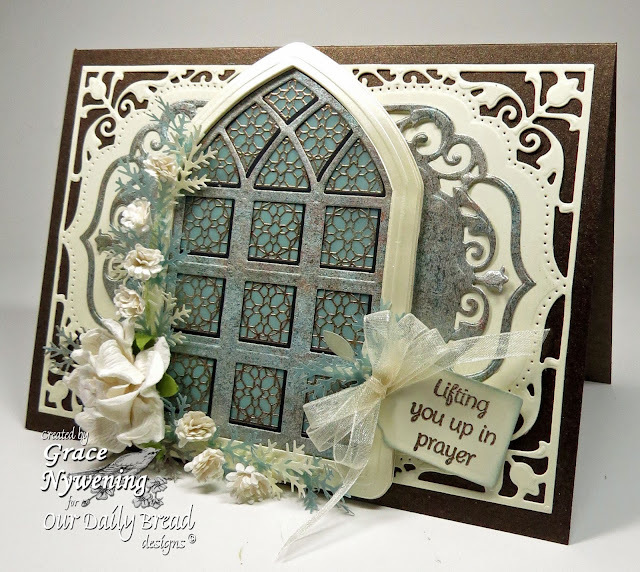 The window is Cathedral Window Marble and the die is an ODBD Custom Cathedral Window Die and Border. You are going to love it!!! I also used a past release for the sentiment (Mini Tags 3) and the ODBD Custom Recipe Card and Tags Die for the tag die cut. The lacy die is my new Spellbinders 5 x 7 Elegant Labels 4. I started with a base of Prism Bronze, added my vanilla SB die cut mat, and then I used the next smaller die from this SB set with Ancient Monument Metallic, by Scrap Metals. Playing off the tones in that paper, I used a blue vellum and heat embossed the Cathedral Window image in a coppery embossing powder. I cut my window once from the Ancient Monument Metallic, once from Vanilla, and once from black so I could add a little shadow to my window panes. I like doing this to give some depth to the windows. Now I just added some flowers, punched greenery from my Martha Stewart punch, and a little vanilla sheer bow for the tag, and I was done. I love how this came out and know I will use this set often. Stay tuned for more ideas coming your way soon! I am entering this in Word Art Wednesday, where you can use their freebie sentiment or any Scripture or encouraging sentiment. Thanks so much for stopping by... and I hope to see you back here on Wednesday for the release blog hop! Absolutely stunning, Grace! Love the muted tones and gorgeous diecuts! Hope all's well! Hugs! Just lovely, dear Grace. I hope you will consider sharing this with us at Word Art Wednesday. Your gorgeous art is always such a blessing to see, and it's always a treat to have you link up with us so everyone can enjoy your work. I hope that you are having a blessed Lord's Day. the Cathedral window is gorgeous. I was curious as to how your did the window panes. whether they were stamped and embossed or part of the die!! It is so beautifully put together. I love it. The background frame is wonderful as well. Oh Grace this is marvellous - I could see it being used for sympathy cards too. Oh my that is absolutely Gorgeous, the embossing in the window is a great touch, and such lovely flower arrangement to frame it! Oh Grace, this is so lovely, and peaceful! It's difficult to believe but your projects and cards just get better and better! A stunning and lovely card Grace. Your layers are just beautiful together, and such elegantly soft and relaxing colors. Aways fun to see your beautiful work. Wow Grace, what a beautiful card! I love it girl. Need to learn from you! wow Grace!! This is just stunning..
Wow..what a stunning card! Looks like you had a wonderful time making it, as I can just feel the love from it. Gorgeous, gorgeous! Happy Father's Day -A sneak peek! A Hymn, A Collage, A Challenge!